Laserfiche Empower 2018 is Jan. 9-12 in Long Beach, CA. We’re having a great time catching up with attendees, learning from expert Laserfiche users and professionals in class sessions, and enjoying some of the exciting new activities at the conference this year. 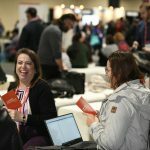 Here are some of our highlights from Wednesday, #LFEmpower Day 1. 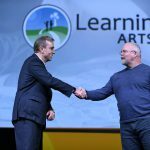 We held our first general session of Empower 2018 on Wednesday, Jan. 10, and we had some amazing keynote speakers and product updates to share! We were honored to have Long Beach City Prosecutor Doug Haubert join us alongside Laserfiche CEO Chris Wacker and President Karl Chan as a keynote speaker. 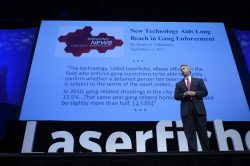 Doug shared wisdom from his 18 years of experience as a civil and criminal prosecutor, and the story of how the City of Long Beach transformed its approach to gang violence using Laserfiche. “I want to take moment right now to thank the men and women of Laserfiche and the Long Beach Police Department. With your help we’ve had the lowest number of gang-related violent incidents in Long Beach history”. Read the rest of their incredible story here. 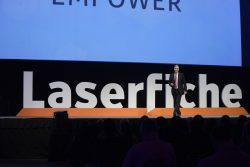 Laserfiche President Karl Chan shared exciting updates on the latest in Laserfiche technology during the Day 1 general session. He discussed the importance of recognizing #DigitalTransformation as a “grassroots change”, and brought out product experts Tricia Swift, Greg Eisenberg and Jared Rechnitz to share the latest Laserfiche product updates. Tricia shared details on location-based searching in Laserfiche Mobile, Greg revealed user-friendly logic testing abilities in Laserfiche Workflow, and Jared shared that Laserfiche is developing a new search reporting tool, allowing users to design flexible reports to help decipher data trends. 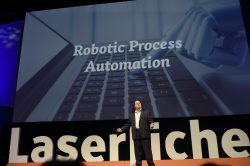 After taking a look at the latest developments in Laserfiche, product expert Justin Pava revealed some exciting news: Laserfiche will soon offer Robotic Process Automation capabilities to enable business process automation with the absence of human touch. 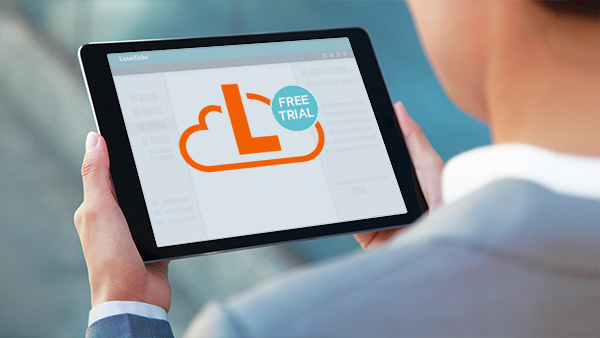 We look forward to sharing these next advances in Laserfiche technology soon! We had so many exciting sessions going on during Day 1, but we’d like to highlight one in particular: Laserfiche: Chopped Edition! 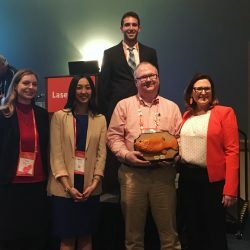 Four talented Laserfiche users–Amy Johnson of the Hanover County Commissioner of the Revenue, Dave Covert of Bonneville Joint School District No. 93, Bev Strickland of the North Carolina Division of water Resources, and Michael Wells of Chesterfield County, Virginia –were pitted against each other in a mock version of the popular TV cooking competition “Chopped”, in which they had to develop business solutions using required ingredients like Workflow and Quick Fields. They proved their Laserfiche prowess by addressing the needs of each business challenge they faced, including backlogs of unorganized paper documents, forms that needed digitizing, and if/then processes that called for Workflow. In the end, Michael Wells was the only contestant not to be “chopped” from the competition, and earned a celebratory trophy for his wall! After a long day of Laserfiche learning, it was time to unwind– to the tune of Sugar Ray, Kool & The Gang, and Journey! 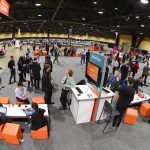 Conference attendees gathered in the Pacific Ballroom of Long Beach Convention Center to enjoy delicious food, a slow-motion video booth, and some incredible live entertainment! We danced to performances from the Wes Quave Band and VOICES: members of some of the most popular bands of the ’80s, ’90s and today. 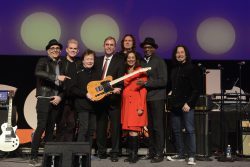 Mark McGrath of Sugar Ray, Art Alexakis of Everclear, Steve Augeri of Journey and Skip Martin of Kool & The Gang were just a few of the great performers that graced the Empower stage! The best part of the night, undoubtedly, was catching up with our Laserfiche community– our people sure know how to party! Day 2 of Empower is sure to be another exciting day of learning, networking, and challenging ourselves to be visionaries in our organizations. We look forward to the rest of the conference together!